Shop card from the twenties for the Esway prop stand. 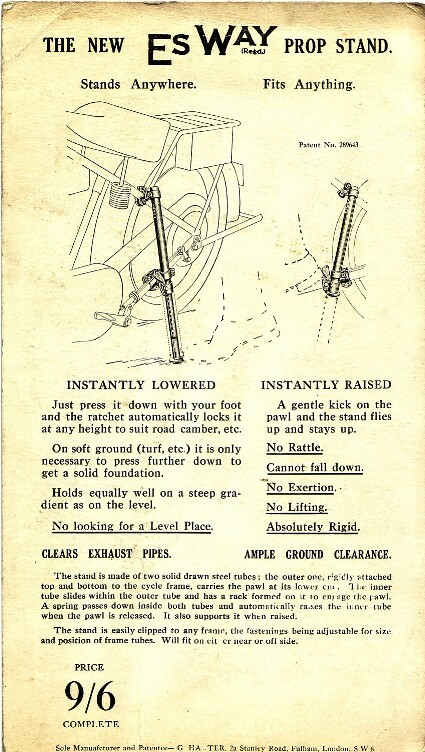 Here's a wonderful invention and from some 90 years past. It was as if they predicted that in decades hence old duffers would be still riding bikes of the era with hard to lift rear stands and no side stands. To be fair though I'm in my late thirties and some fifteen stone and still find my Triumph N slightly risky for my back to get it onto its' rear stand. 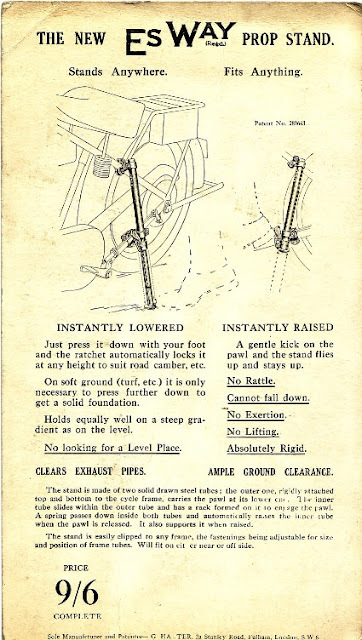 I first got wind of the Esway prop stand (I suspect it is intended to pronounced as 'Easy Way' - in our times we might write EZ Way but they perhaps had more finesse in the twenties!) 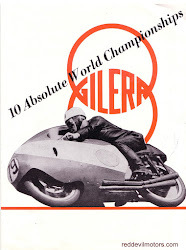 when I picked up a job lot of vintage bike ephemera and found an advertising card amongst it. Then I found a stand minus fittings at an autojumble, put it on the shelf and didn't give it much thought for a while. 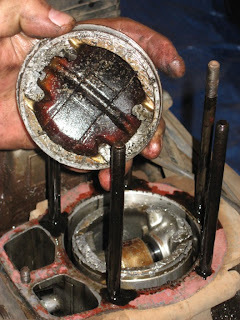 Then last summer a chap in the local VMCC had an Esway fitted to his flat tank Sunbeam. I would have been jealous of how easy he could park his bike up and walk off if I didn't already have one myself. Esway prop stand fitted to 1927 Triumph Model N.
More recently I acquired another stand and this time with fittings. 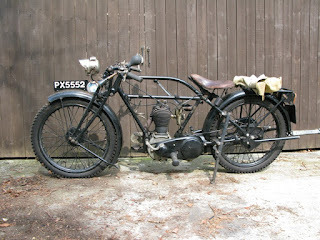 Soon on it went to my 1927 Triumph Model N. It fitted straight on with no modification. 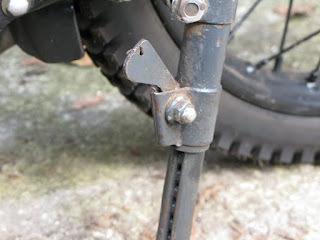 It does stick out a little but not a problem as lean angle is not too critical on an old side valve Triumph. Close up of Esway prop stand telescope ratchet mechanism. More important is that it works a treat.The stand telescopes out to the required length and a ratchet holds it against its' spring. The beauty of the design is that you can put out the stand to the required length for the parking spot. To retract the stand you just flip a spring loaded lever with your boot and it telescopes back up (quite violently in fact and I'll have to see if I can adjust this). 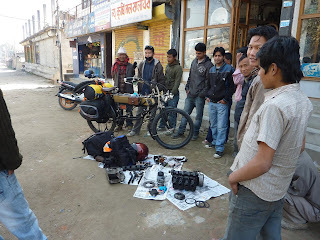 The Model N again minus tank and mag but standing up..
Ron Fellowes' 1910 FN under repair in Nepal. Just recently I came across this blog of a rather amazing journey by an Australian, Ron Fellowes, who is riding his 1910 FN four overland from Nepal to Belgium via Pakistan and Iran. 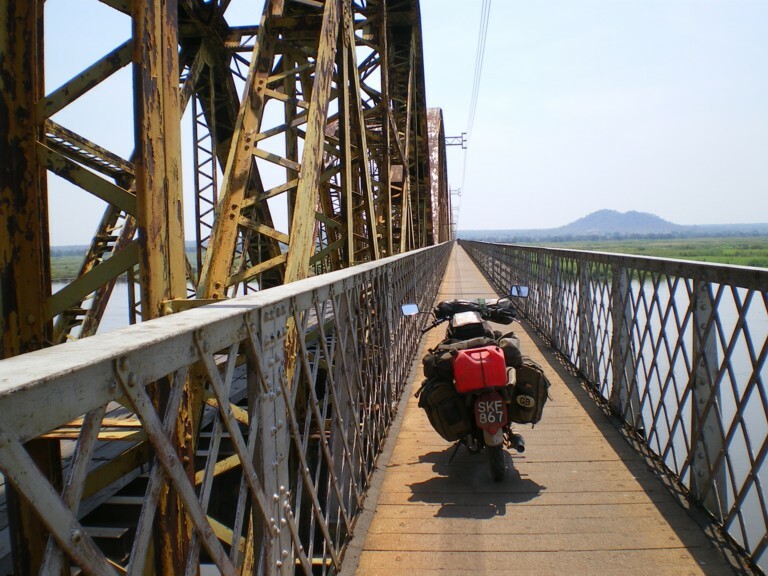 The India overland route is one of the classics but it's not an easy one on any bike, least of all one more than 100 years old. 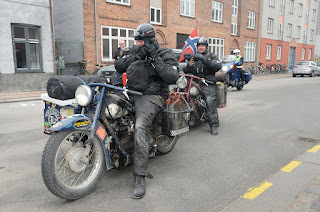 There's some terrain to challenge the rider of a modern bike and it will certainly test an antique one, these days however many folks would hold reservations about overland travel through Pakistan on the basis of personal security. I've always held that the vast majority wherever you go are just regular people striving to get on with everyday life. They hold little concern for world politics and least of all any animosity to you personally. I've found myself relying on the hospitality of strangers in strange countries many times and have never been let down by their generosity. People in Pakistan in particular have been incredibly generous to me in the past. That's not to say though that a ride through Baluchistan wouldn't be a daunting prospect.. So hats off to Ron. Well done! And good luck with the rest of the trip. Pass storming in the Himalayas on a Royal Enfield Bullet. Ron's journey is certainly a biscuit taker as far as I know for the age of bike used. 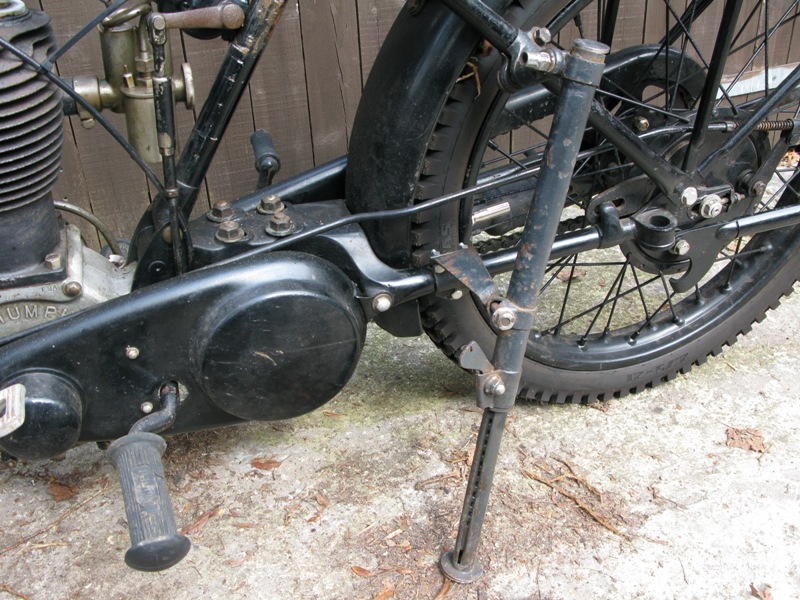 For me using a post war bike is a relatively easy choice, even perhaps sensible for reasons I will go into. A thirties machine is still very practical but once you start mixing beaded edge tyres and open valves with hot, dusty and rough roads you are making things a lot tougher for yourself. But then again you are only facing the same conditions as the pioneers did a hundred years back. My 1955 Royal Enfield Bullet in Mozambique. 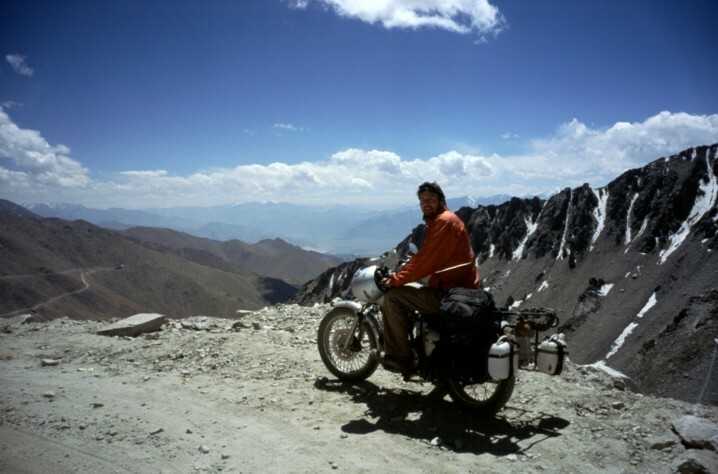 My first overland trip was around India on a 1997 Royal Enfield Bullet and then India to UK on a 1958 model via Pakistan, Iran and Turkey. That was back in 1998/9. Since then I've made a short trip around the high passes of the Indian Himalayas in 2005 on a Bullet and then a trip around most of the outside of Africa on a 1955 Bullet between 2006 and 2008. From the UK down to Cape Town via the Middle East and down the East coast of Africa and then back towards home, getting as far as Mali up the West Coast. 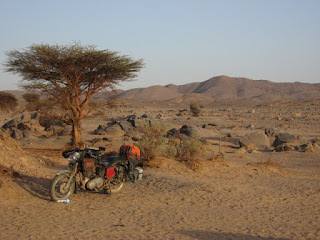 I kept a blog of these travels on the Horizons Unlimited website, a treasure trove for anyone contemplating or underway with an overland trip whether by motorcycle, bicycle or car. 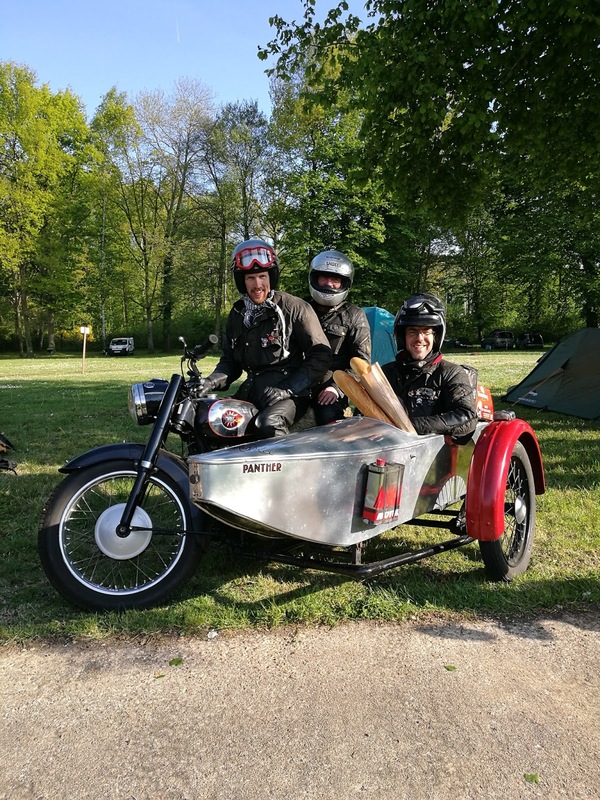 One of the inspirations for my Africa trip was from a Dutch couple who travelled from Cape Town back to Holland on an Indian 350cc Bullet two up with a trailer. They've since made a trip with the same rig through the Americas. Some pictures from their trip can be found here. Round the world Nimbus' or is that Nimbii? The thing about adventure travel is that whatever you are doing and no matter how trailblazing you think it is there will always be someone doing something more outrageous, This has always been the case, think back to Scott and Amundesen... Of course nowadays we are not representing Queen and country and it is not a race. It is purely for fun so I take my hat off to those undertaking adventures of perhaps greater derring do. I reference the couple riding through Africa at the same time as myself on a early fifties rigid frames Triumph Thunderbird. I never managed to meet them and they have no web presence. I salute the Frenchman on a moped from Burkina Faso to France. And I take my hat off to Norwegian gentlemen Tormod and Klaus of the 'Dumb Way Round' aka 'King Croesus Contempt for Death' riding round the world on Danish Nimbus motorcycles with sidecars. Pop goes the Bullet in Malawi! Setting up camp with the Bullet in Sudan. 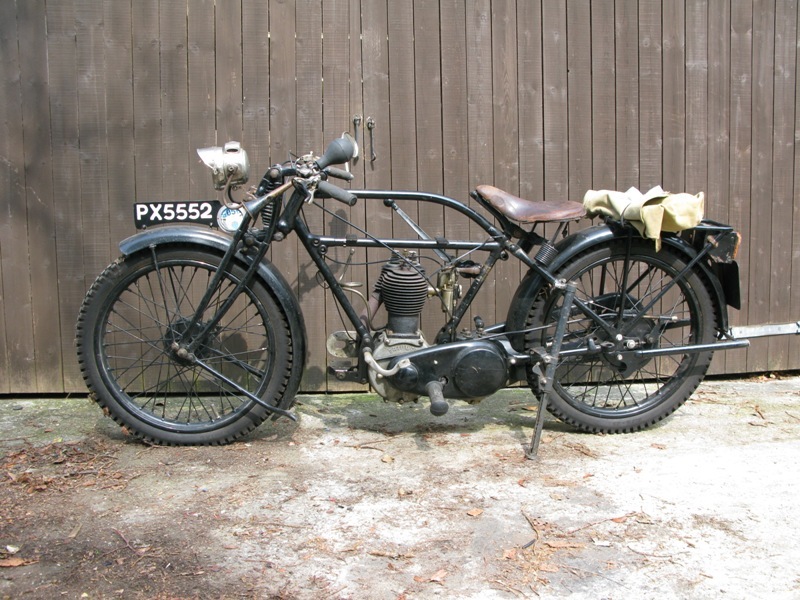 Gordon May has done his bit to stem the tide of Indian Royal Enfields being ridden to Europe by taking a Redditch built one over to India and written a book on it - Overland to India, a good read. He followed it up with Overland to Egypt, doing what it says with a 1952 BSA Bantam inspired by Peggy Thomas' travels in the fifties on a similar Bantam and written up in the book, A Ride in the Sun. Rumour has it he is soon to take his Bullet down to Cape Town. 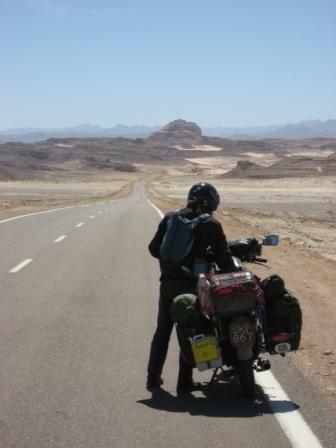 The bottom line is that any journey on a classic or vintage motorcycle is an adventure. Even just down to the shops. Folks seem concerned to take their old bikes big distances but the chances are that if it'll complete a Sunday run it can keep on and on. So pack up, set off and keep going!